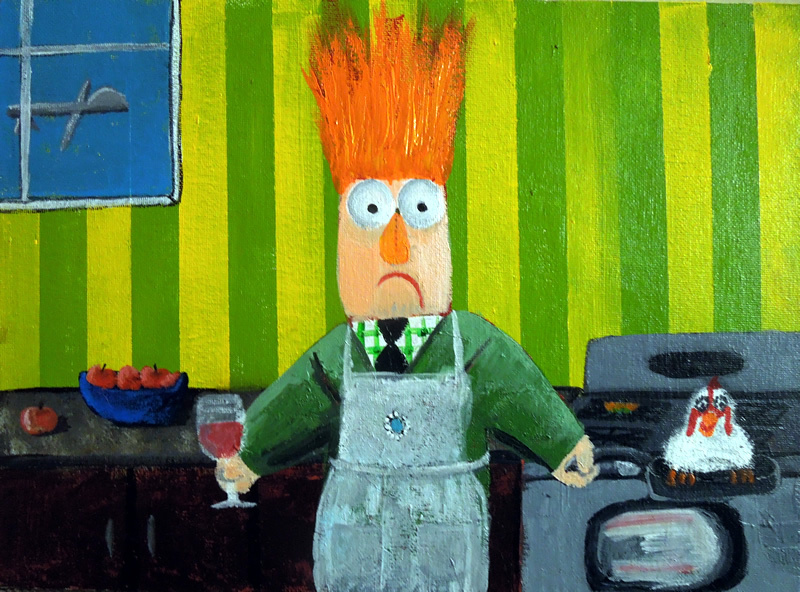 Painted on an 9″x12″ pressed canvas board, this is Beaker painted in the style of DC artist, Dana Ellyn. Key Ellyn-esque elements include the striped wallpaper, the drone in the window, the wedding ring on the apron, the apples, the soon-to-be-dinner chicken, and of course, the wine. It will be part of a “Who Dunnit” show at the ArtDC Gallery in Hyattsville, MD. Opening on February 9th, 2013, the show’s theme is that “imitation is the sincerest form of flattery” where viewers will embark on a treasure hunt to determine if a piece was done by the original artist or somebody else. Who doesn't love Beaker? I started painting in 2009 as a student of DC artist, Dana Ellyn. After experimenting with different painting subjects, I found a fondness for toys. After realizing I had tons of photos documenting my travels with a Beaker finger puppet, I started to paint Beaker. The rest is history. I hope you enjoy my art. Beaker is my muse.